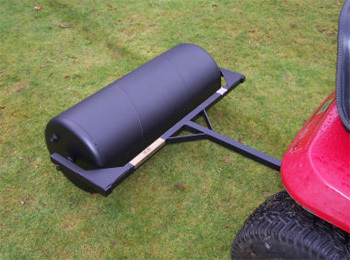 This steel garden roller is suitable for use with front engined ride on mowers with a minimum 10hp. Working width is 90cm/36 inches and the roll has a diameter of 36cm/14 inches. The SCH SAGR weighs 32kg and can be ballasted with water to a maximum of 116kg. In areas where a ride on mower cannot access or is not available and optional hand conversion kit is available.